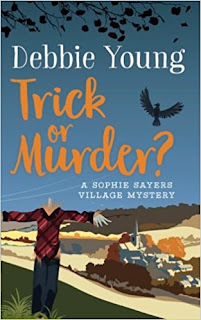 Promoting Crime Fiction by Lizzie Hayes: ‘Trick or Murder?’ by Debbie Young. Trick or Murder is the second book in the Sophie Sayers mystery series. Set in the pretentiously sounding Cotswold village of Wendlebury Barrow, that feels as if it is still existing in the 1950s (unbelievably they still have a bookshop), this series is a delightful cosy mystery. 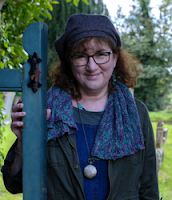 In the previous book Sophie Sayers has moved to Wendlebury Barrow after inheriting her aunt’s cottage and she is now trying to establish her position in the village and set down roots. She works in the local bookshop, which gives her the opportunity of meeting people and finding out things, and she has a set of close but eccentric friends and neighbours. Sophie is also pursuing the shop owner Hector and at the heart of this book is the will-they-won’t-they romance. Alongside of this are the constant sagas caused by the new local vicar, a tyrant dictator who doesn’t believe in fun and offends everyone he meets. Set around the time of Halloween, the vicar bans any kind of festivities. Bonfire Night will be the only celebration and the hilarious opening chapter portrays a visiting American couple viewing our British customs as weird and somewhat scary as they speed through Wendlebury Barrow towards the safety of a town. The opening however is a foreshadowing of the unfolding story. The local children have all been encouraged to create Guy Fawkes’ but one of the ones on the bonfire is actually a real person. Who is on the bonfire and why? Are they dead or alive? Will they be found? These are the questions that stay with the reader as they progress through this warm and witty, feel-good novel.